The deputy leader of al-Qaeda was not in a Pakistani village near the Afghan border which was hit in an apparent missile attack, Pakistan officials say. The unnamed officials said the attack - in which at least 18 people were killed - was based on "false information". Quoting intelligence sources, US media said it was a CIA raid. The US military says it is not aware of any operations taking place in the Bajaur tribal area. Pakistan's information minister condemned the attack. Sheikh Rashid Ahmed told a news conference the US ambassador would be summoned to explain. 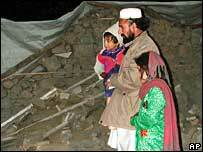 The Pakistani government wanted "to assure the people we will not allow such incidents to reoccur", Mr Ahmed said. He said he did not know whether Zawahiri had been in the area at the time. 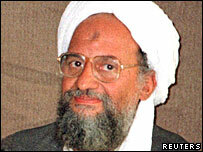 Zawahiri has eluded capture since the US overthrew the Taleban in Afghanistan in 2001 despite a $25m bounty on his head. Osama Bin Laden's second-in-command is regarded as the ideological brains behind the al-Qaeda network, says BBC security correspondent Gordon Corera. The Egyptian has also become its most visible spokesperson, issuing a number of video and audio tapes, whilst Osama Bin Laden has not been seen or heard from for more than a year. The raid took place in the village of Damadola in the Bajaur tribal area, about 7km (4.5 miles) from the Afghan border. Locals earlier claimed the missiles were launched from neighbouring Afghanistan in the early hours of Friday, but officials there deny it. Jets - or in some accounts a Predator drone - reportedly fired missiles at a particular housing compound in the village. Some accounts say foreigners were killed in the attack, and their bodies removed. Tribesmen there are convinced the strike was the work of the Americans and are very angry at the attack. Reporters who reached Damadola spoke of three houses hundreds of metres apart that had been destroyed. Shah Zaman said he lost two of his sons and a daughter. "I ran out and saw planes. I ran toward a nearby mountain with my wife. When we were running we heard three more explosions. I saw my home being hit. "I don't know who carried out this attack and why. We were needlessly attacked. We are law-abiding people." A Pakistani intelligence official told Reuters news agency that Damadola was the stronghold of a banned pro-Taleban group, the Tehrik-e-Nifaz-e-Shariat-e-Mohammadi. The US has about 20,000 troops in Afghanistan, but Pakistan does not allow them to operate across the border. Pakistan has about 70,000 troops in the border region.